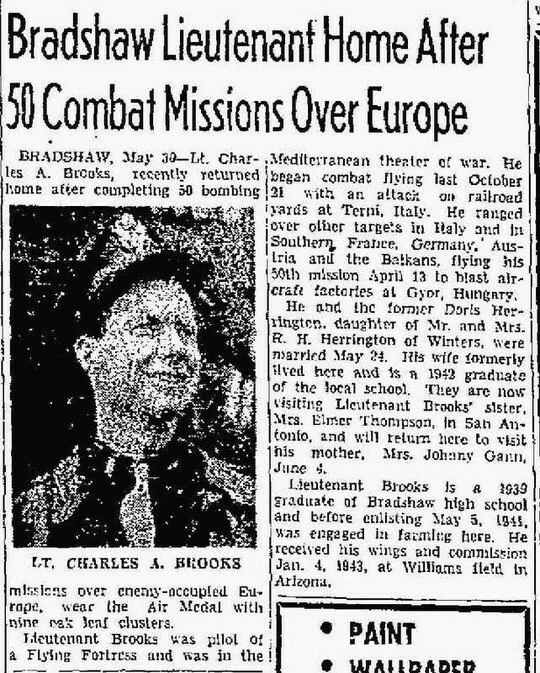 Charles Alonzo 'Charlie' Brooks, son of James M. Brooks and Naomi Allie Reid, married to Doris Maxine Herrington and buried in Hillcrest of Memory Cemetery, Hillsboro, Hill County, Texas. Lieutenant Colonel Charles Alonzo Brooks of Hillsboro passed away Thursday, July 15, 2004, at 5:22 a.m. at the age of 85. He was born May 27, 1919, in Shirley, Arkansas. He graduated from Bradshaw High School in Taylor County and joined the U. S. Army Air Corps, serving in World War II as a bomber pilot. He continued to serve his country in the Air Force Reserves, retiring as a lieutenant colonel. He graduated from Texas Tech State University in 1949 with a B. S. degree in agriculture and worked for the Soil Conservation Service for 30 years. He was a farmer/rancher, real estate agent and flew search and rescue missions for Civil Air Patrol. He was a member of First Baptist Church of Hillsboro. He is survived by his wife of 60 years, Doris Herrington Brooks of Hillsboro; his daughter, Deborah Harper and son-in-law, Malcolm, of Buda; and two grandchildren, Jill and Carl Harper, both of Buda; one sister, Nora Lucille Callaway of McKinney; one brother, James M. Brooks of Abilene; and many nieces and nephews. Funeral services with military honors were held at 10:30 a.m. Saturday, July 17, 2004, at Edens Funeral Home Chapel in Hillsboro with Rev. Kenneth James officiating, assisted by Larry Harless. Interment was at Hillcrest Garden of Memory near Hillsboro.